It’s a smelly job but worth it! Our whole lambs are perfect for those looking for large bulk purchases, sharing with family or if you have an event to cater for. 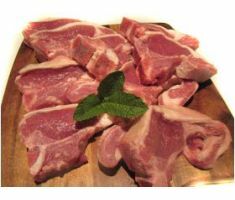 We can supply Whole cut, Whole quartered or entire carcasses. Please be aware that as the lamb comes cryovaced, the meat is in an oxygen depleted environment. This means that the wet ageing process will occur during refrigerated shelf life. Wet aging results in even more tender lamb without effecting taste or quality. This is why you see absorption pads in meat packaging - they are designed to absorb these meat juices. You may experience a confinement odour and some discouloration of meat juices depending on length of time since the packed date. To prepare wet aged meat simply rinse off the excess meat juice and let lamb stand to breathe for 10 – 15 minutes prior to cooking. You will notice the meat regain it's natural colour and smell. How Down to Earth Produce began. The land we love that produces our tasty lamb. Feel free to ask us any questions. From production to purchasing products, we have an open gate policy.